Ilorin- Kwara State High Court, sitting in Ilorin, on Wednesday recognised the executive committee of the Ishola Balogun-Fulani faction of the All Progressives Congress (APC) in the state. This development has therefore resurrected the supremacy battle between the ruling Peoples Democratic Party (PDP) and the main opposition party,All Progressives Congress (APC). The PDP had since been put on the political edge having been defeated by the APC during the recent House of Representatives bye election that took place in the state. The factional APC under the chairmanship of Alh Ishola Balogun-Fulani which got favourable court judgement was widely believed to be loyal to the Senate president, Dr Bukola Saraki being the state chairman of the APC before some members decamped with Dr Saraki to the Peoples Democratic party. The national chairman of APC Comrade Adams Oshiomole consequently dissolved the executive and installed another state executive under the chairmanship of Hon Bashir Bolarinwa. But Alh Ishola Balogun-Fulani and the dissolved state executives headed to court, insisting that they were constitutionally constituted, hence Comrade Adams Oshiomole had no power to unilaterally dissolve the executive. The court further held that,”the Independent National Electoral Commission (INEC) should recognise the list of members of the executive committee presented by the Kwara APC executive committee led by the Balogun-Fulani faction. But in a swift reaction, the All Progressives Congress(APC) in the state backed by Comrade Adams Oshiomole boasted that, the Wednesday court ruling that affirmed the status of Alhaji Isola Balogun-Fulani led state executive council will not halt or weaken the ongoing train of change in the state. The party also said that it has reported the alleged misdemeanor of Justice T.S Umar to the National Judicial Council (NJC) for necessary action. The state chairman of the party, Hon.Bashr Bolarinwa who spoke at a press conference at the state party secretariat along Zango Ilorin said that the party has filed an appeal at the Court of Appeal in Ilorin against the ruling. Displaying the court ruling to journalists, he noted that the court, in its judgment granted them what they did not ask for in their suit, stressing that you can only get what you asked for in legal parlance. He said that the national executive of the party, which derives its powers from the party constitution, which also by extension derives its powers from Nigeria’s constitution has powers to dissolve any erring executive, and was therefore hopeful that the higher court of appeal would do the needful. According to Bolarinwa , “No judgment of any court can stand in the way of judgment of God. “No judgement can halt the moving train of change in Kwara as those who stand in the way of a moving train must know the likely consequences”. Bolarinwa added that, “the impending change in Kwara is God at work “O to ge” slogan (enough is enough) is a divine vehicle which no human contraption and judgment can halt, how much more of truncating. Let me state that the law is clear in party primaries for election of candidates and no procured judgment of any high court can change the established position as stated and restated by the apex court in Nigeria. “Therefore, all our 24 state of assembly, six House of Representatives, three senatorial, governorship and presidential candidates elected at the primaries conducted by the national working committee in accordance with article 13.4(v) and (xiv) of the constitution of the party remain the authentic candidates that will fly APC’s flag at the 2019 general elections”. He therefore urged the army of change to go out and continue with their ongoing mobilisation so as to wrestle power from the ruling government during the 2019 elections. Meanwhile, chairman of the court recognised executive committee of the All Progressives Congress (APC) in the state, Hon. Ishola Balogun-Fulani had earlier asked the national leadership of the party to recognise and act on the list of candidates for 2019 election in the state submitted by his committee. Balogun-Fulani who spoke with reporters after the court judgement claimed that his committee duly conducted primaries in which the candidates emerged and duly submitted their lists to the national leadership. 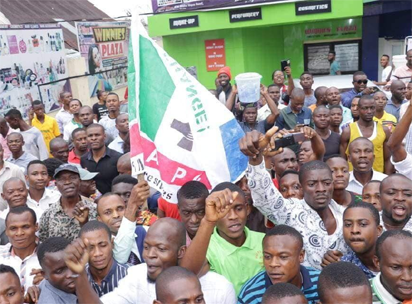 He said Kayode AbdulWahab , a former Majority Leader of the State House of Assembly was the duly elected governorship candidate while his running mate was Olorunfemi Adeoye. Balogun-Fulani who claimed that the national chairman of the party, Adams Oshiomhole had promised to abide by whatever was the court verdict said since the court has affirmed that his committee was the legally recognised executiveve body of the party in the state the list of the candidates submitted by the committee was authenticated and the national leadership should act on it as required. He said,”It has has been authenticated that our governorship candidate sent to the party headquarters is Hon. Kayode Omotose while his running mate is Olorunfemi Adeoye and we want the National Executive Committee to do the needful”. The chairman also called on the House of Representatives to swear in Kehinde Olatayo whom he described as the right candidate of the APC in the recently conducted bye election of the Isin/Irepodun/Ekiti/Oke-Ero federal constituency in the state won by the party. He said that his committee conducted a primary election for the bye election and that Olatayo was the winner of the primaries. It is expected that the court will speedily decide this matter before the 2019 elections in order to avoid constitutional and political crisis in Kwara state. Phnewshub is Port Harcourt's top and first class news website. we provide reliable, latest, and breaking news on the go.